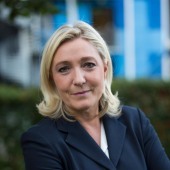 Ms Le Pen, leader of right-wing National Rally, is set to team up with the Italian deputy prime minister’s League movement to form a transnational supergroup after the European Parliament election. The French populist chief has seemingly scrapped plans for Frexit and an exit from the EU’s Eurozone bloc as she seeks to reform her own party. Matteo Salvini’s master plan to bring together the entire European right did not get off to a great start, as no representatives of Marine Le Pen’s National Rally or Austria’s ruling Freedom Party (FPÖ) showed up at a conference he called in Milan today. BRUSSELS: Italian Deputy Prime Minister Matteo Salvini sends texts with smileys to French far-right leader Marine Le Pen and posts selfies with Austrian far-right politician Heinz-Christian Strache. The face of the leader of Italy's far-right League party is beamed onto big screens at right-wing rallies from Prague to Sofia. By Alissa de Carbonnel and Giulia Paravicini. BRUSSELS (Reuters) - Italian Deputy Prime Minister Matteo Salvini sends texts with smileys to French far-right leader Marine Le Pen and posts selfies with Austrian far-right politician Heinz-Christian Strache.